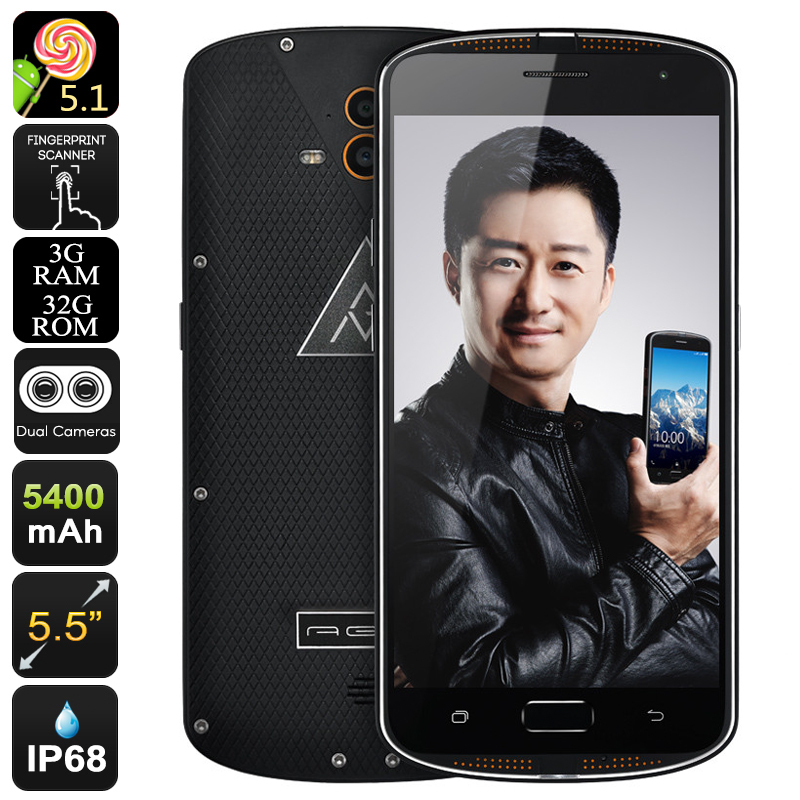 Successfully Added AGM X1 Rugged Smartphone - Dual Lens Camera, 4G Dual SIM, IP68 Waterproof, FHD Octa-Core CPU, 3GB RAM, 5400mAh Battery to your Shopping Cart. For many people the large and bulky designs of modern day’s fully rugged smartphones might be a reason to choose another device instead. AGM’s newest smartphone, the AGM X1, is a fully rugged smartphone that has been rated IP68 waterproof, shockproof, and dustproof yet its looks are remarkably sleek and style full. This Chinese smartphone offers the best of both sides – fully rugged, powerful hardware, and a beautiful and sleek design. Featuring an AMOLED 5.5 inch display the AGM X1 smartphone provides higher refresh rates than similar smartphones using alternative display technology, often increasing the response while, simultaneously, reducing power consumption significantly. Combined with its massive 5400mAh battery this smartphone is capable of providing you with up to 10 hours of continuous usage time and a staggering three days of stand by time – enough to enjoy all your favorite movies, Apps, and games throughout the entire day without needing to worry about running out of juice. With its Octa-core CPU clocked at 1.5GHz and 3GB of RAM you can be ensured that the AGM X1 is capable of running all the latest Apps and games without much of a struggle. Its 5.5 inch FHD display allows you to enjoy all your multi media files in a staggering 1080P resolution, giving you among the sharpest image resolution available to modern day smartphones. Packed with 32GB or internal memory and up to 128GB or external memory the AMG X1 is the perfect platform to carry around all your files, movies, pictures and more without ever needed to worry to run out of storage space. Smartphone cameras can do astounding thing nowadays, however, most of the regular phones are starting to reach some hard physical limits when it is about smartphone photography. The AGM X1 is equipped with the latest smartphone camera technology has features dual-camera technology. With its dual camera technology this Chinese smartphone is capable of snapping pictures of mesmerizing and professional quality without increasing the actual thickness of the device itself. Take pictures of breathtaking quality with a sharpness and clarity rarely experienced before with smartphone photography. Holding the AMG X1 feels like having a miniature professional camera in the palm of your hand. The AGM X1 rugged phone comes with a 12 months warranty, brought to you by the leader in rugged phones as well as wholesale electronic gadgets..